connect to the Test Tool Provider system from another LTI Tool Consumer. 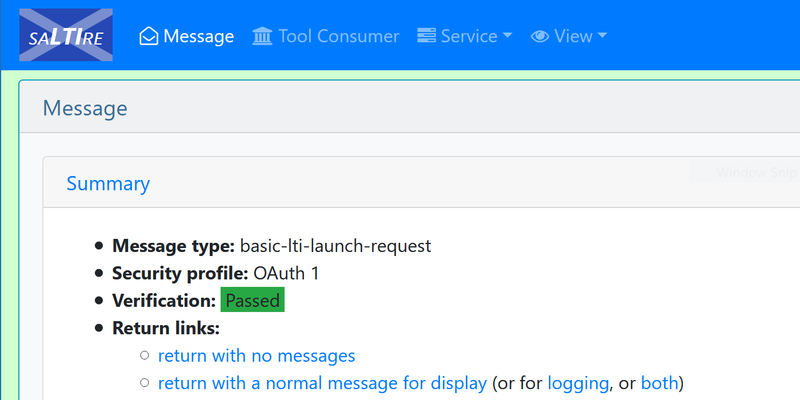 Note that the tools are designed to allow both valid and invalid communications to be sent and received, hence they do not ensure that only valid (compliant with the LTI specification) messages are composed. This allows the system to be used for testing that other systems properly handle invalid connections, not just valid ones. Added "Save" button to Test Tool Provider to allow changes to be retained (1-Dec-17). The content below provides some information which you may find helpful when using the tools. By default all options are enabled (check the Options form to turn on additional features). Select the Tool Provider page and check the credentials. Click on the Connect button to send a message to the Tool Provider. Used to update the system when the Save button is disabled (useful to refresh the current connection message in case it times out). Each message parameter is tagged as being either Required, Recommended or Optional; this option will remove the values from all the recommended and optional parameters. This will clear the system and reset all values to their defaults. Open the Options form (see below). Note that some options within the system will be disabled when settings have been changed - use the Save to resolve this. Display unsupported features (but disabled)? Open connections in a new window? Include empty parameters in message? Only support outcomes for learners? Each parameter supported by the LTI specification has an input box containing its current value. The associated checkbox can be used to disable the parameter to stop it from being sent in the message. Some parameters have a menu which can be used to select a value, but values may always be entered manually. A checkbox is provided on the Tool Consumer page for each algorithm which is to be available. The selected algorithms are available for signing the current message on the Message page. A checkbox is provided on the Tool Consumer page for each service which is to be available. A settings panel is displayed for each selected service. Each supported capability can be enabled on the Tool Consumer page. Capabilities related to services are not included here, but are automatically assumed when a service is selected. Capabilities are divided into categories based on their type or prefix. Clicking on the title expands and hides the capabilities for the category. Clicking on the Connect button on the Tool Provider page will cause a message of the type selected on the Message page to be sent to the Tool Provider using URL and credentials supplied on the same page. You can preview the message or override where the connection is opened via the drop-down menu. Only those parameters on each page which have been checked will be included in the message. Service parameters for any selected service will automatically be included as well. Custom parameter substitution variables will be replaced where an appropriate value is available (for example, $User.username). Clicking on the Register button on the Tool Provider page will cause a ToolProxyRegistration message to be sent to the Tool Provider. 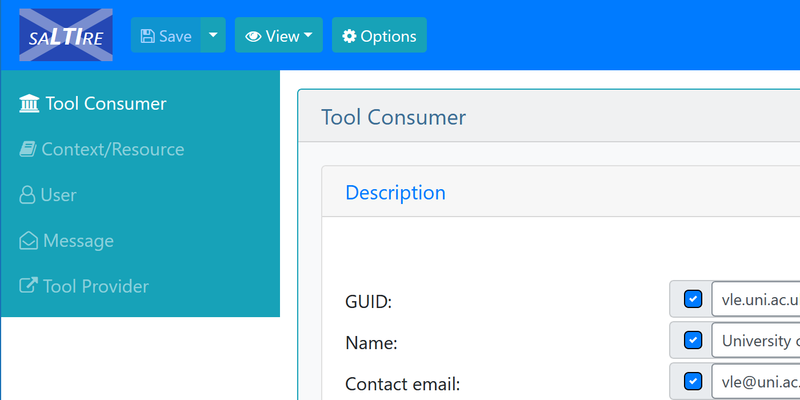 The Tool Consumer Profile will include those services and capabilities which are selected on the Tool Consumer page. When a Tool Proxy is accepted, the Tool Provider page is replaced with a copy of the Tool Proxy and a summary of the agreed credentials. The services and capabilites on the Tool Consumer will be selected based on the services in the security contract and the enabled capabilities for a resource. Any parameters required for the message type will always be selected. All others are signified by a checkbox with a shaded background - the system allows the choices to be changed but the checkbox presentation will identify which formed part of the agreed Tool Proxy. A resource defined in the Tool Proxy should be selected from the menu provided on the Tool Proxy page. A message supported by the resource should be selected on the Message page. A Tool Proxy can be cancelled by clicking on the Unregister button. use the Save option to refresh the message in case the timestamp has expired. Try using the Start new session option from the Save menu to reset the data; you may have been impacted by system updates made during your session. If you're not seeing all the parameters you expect, check that you have the Display optional features? option selected.